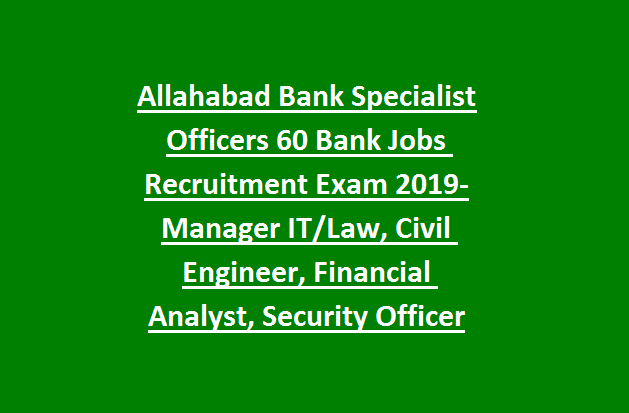 ALLAHABAD BANK Specialist officer's recruitment 2019. Available posts are Manager IT/Law, Civil Engineer, Security Officer and Financial Analyst. Eligibility criteria met candidates only apply online on or before 29-04-2019 through the official portal of Allahabad Bank. Selection for this ALLAHABAD BANK Specialist Officer's posts will be held based on online common written test and personal interview. 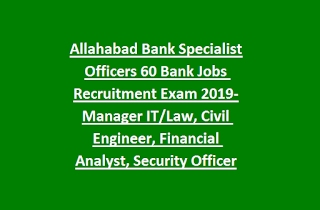 For more information regarding this Allahabad Bank Specialist Officers recruitment of please see the data given below. There are total 60 vacancies available in this current recruitment of ALLAHABAD BANK Specialist Officers. Available vacancies and posts details are given below. The candidates age limits are 20 to 35 years as on 01-04-2019. Age relaxations for SC/ST candidates 5 years, For OBC candidates 3 years and for PWD candidates age relaxation is 10 Years. For the posts of SO Chartered Accountant/Financial Analyst the candidate must have qualified CA or CFA/ ICWA/ Full time MBA (Finance)/ PGDBM (Finance). For the post of SO Security Officer graduation in any discipline. For the post of SO Civil Engineer B.E/ B.Tech in Civil Engineering Discipline from a recognized university. For the post of SO Electrical Engineer B.E/B.Tech in Electrical Engineering from a recognized university. For the candidates of General, OBC application fees is Rs.600/- and for the SC/ST/PWD candidates Rs.100/-. The candidates have to pay this amount through the online payment only via the credit/debit card or net banking. Selection for this Specialist Officers recruitment will be held based on Written test and Personal Interview. Written test will be conducted for 185 marks with 120 minutes duration. The eligible candidates have to login to the official website of Allahabad Bank @allahabadbank.in and apply for the post which is suitable to your educational qualifications. Before applying online please read the official notification and provide a valid mobile number and mail id. Apply online for the recruitment of Allahabad Bank Specialist Officers. Official notification of Allahabad Bank recruitment of Specialist Officers. Please share this information with your beloved friends and help them to achieve a high salary job in Allahabad Bank.